Up to 35,000 different peptides in duplicate for high throughput screening are displayed on PEPperCHIP® Discovery Microarrays. Fully tailored according to your research needs, PEPperCHIP® Discovery Microarrays provide optimal solutions for large-scale antigen and epitope discovery screens for e.g. Array Content: Overlapping peptides for multiplexed epitope mappings, custom peptide collections etc. Optimal array design and project setup are thoroughly supported by peptide microarray experts from PEPperPRINT. Please contact us to discuss your requirements and preferences. 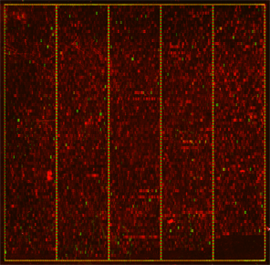 Due to the uncommon discovery microarray format, PEPperCHIP® Discovery Microarrays are exclusively provided in combination with a PEPperMAP® Services. PEPperCHIP® Discovery Microarray design and production takes about 4 weeks starting from confirmation of the microarray content. We usually ask to ship the sample(s) within this period. Subsequently, the assays will take around 1-2 weeks followed by another week for data quantification, evaluation and reporting. A custom screening service based on a PEPperCHIP® Discovery Microarray hence requires around around 6-7 weeks from microarray production to delivery of the scientific report.